Jump to imperial unloaded U-cup sizes. Jump to metric unloaded U-cup sizes. The urethane U-cup design provides an excellent heavy-duty seal for both piston or rod applications. Urethane U-cups, commonly known as Disogrin U-cups, work well in both static and dynamic applications. The rod style unloaded U-cup was designed with a shorter, heavier inside sealing lip to achieve a higher initial sealing force on the tube. The rod style unloaded U-cup was developed to extend serviceability and improve reliability in rod sealing. The rod style unloaded U-cup is available in a double lip design. The secondary “bump” or lip on the inside heel of the seal provides additional stability in the seal groove. The increased stability enhances the long-term performance of the seal. In rod seal leakage test, the double-lipped rod style unloaded U-cup had better performance then the conventional U-cup. This is due to the initial leakage of the seal is being reduced by the secondary sealing lip. This design provides satisfactory service for most rod and piston sealing applications. For more demanding applications with higher temperatures and pressure, other designs should be considered. The piston style unloaded U-cup was designed with a shorter, heavier outside sealing lip to achieve a higher initial sealing force on the tube. The piston style unloaded U-cup was developed to extend serviceability and improve reliability in piston sealing. Unloaded piston U-cups are also available with anti-extrusion rings. The profile fits a standard u-cup gland, while providing increased extrusion resistance. The chart below provides a general guideline on surface finish. Pressure and velocity are two of the factors that will affect seal integrity. The unloaded urethane U-cup is designed to operate between 0 to 250 feet per minute at 1000-3500 psi. However, the unloaded U-cup can operate at up to 900 feet per minute in low or negligible system pressures. The unloaded urethane U-cup’s performance varies depending on temperature, lubrication, and the chemical environment. 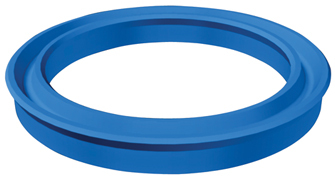 Performance capabilities can be extended with the use of an anti-extrusion ring.